Vinyl fences are highly customizable and can provide your property with a beautifully quaint sense of security. A great fence can enhance the beauty of your outdoor space and provide an invaluable sense of security. A dirty or unkempt fence can attract negative attention from your neighbors, guests, or potential buyers if you are looking to sell. Installing a new fence or restoring the condition of your current residential fence is a great way to increase your curb appeal and the value of your property this spring. Let’s talk about how you can make the most of your fence. One great thing about residential fences is that they can be constructed using various different materials. Are you looking for a classic, cost-effective wood fence? How about a higher security, yet polished aluminum fence? 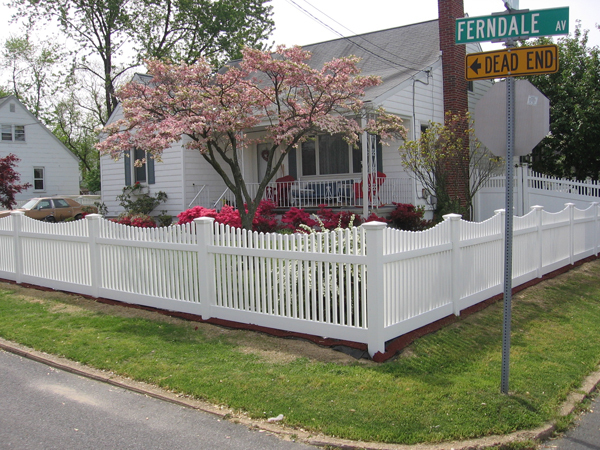 What about a highly customizable vinyl fence? Regardless of the material you choose, your fence can be custom designed to compliment your current property and landscaping in a beautiful way. If you want to use your fence to increase your curb appeal in the spring, decorate it! Use plant boxes, colorful flowers, decorative flags, and other bright items to draw attention to your beautiful fence and make your property seem more inviting and pleasant. May is all about Mother’s Day, graduation season, and Memorial Day – consider these holidays when decorating. Spring is all about outdoor entertainment. Investing in a new fence gives you the opportunity to enjoy outdoor living with your family and friends with ultimate privacy. Certain options, like child safety fencing, are incredibly beneficial for homeowners with swimming pools who like to entertain people with small children or pets. A new fence can increase the safety of your guests and give you optimal privacy to entertain comfortably, without feeling like you are disturbing your neighbors.